TeslaTesla’s car production factory in Fremont, California. China’s policies toward foreign automakers have frustrated Tesla CEOElon Musk. China collects a 25% tax on imported vehicles and doesn’t allow foreign car companies full ownership of their Chinese production plants. Musk used a tweet President Donald Trump wrote on Wednesday as an opportunity to air his frustrations with China’s policies toward foreign automakers and ask if the Trump Administration will address them. While it’s the largest automobile market in the world, China isn’t the easiest place for American car companies to operate. On top of a 25% tax on imported vehicles, China doesn’t allow foreign car companies full ownership of their Chinese production plants. 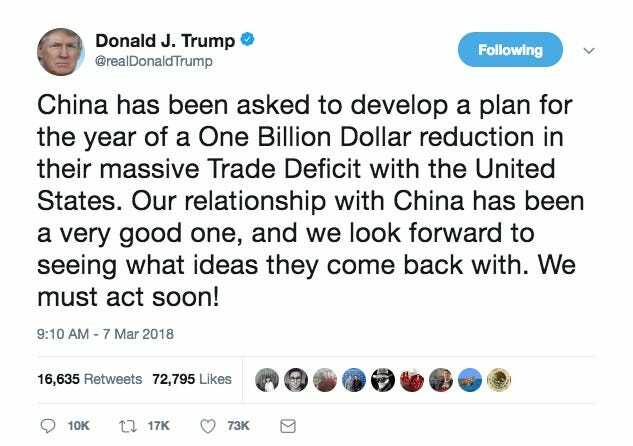 Instead, they must partner with a Chinese company. These policies have frustrated TeslaCEO Elon Musk, who wants to capitalise on the country’s growing demand for electric vehicles. 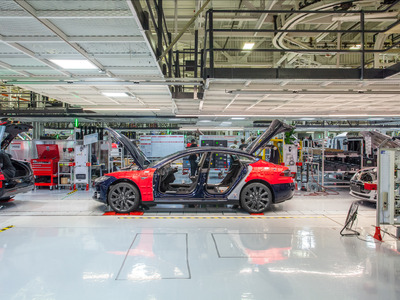 In recent months, Tesla’s plans to build a production plant in China have stalled over a disagreement with Shanghai’s government over the plant’s ownership structure. Tesla wants full ownership of the factory, while China’s central government wants a Chinese company to have an ownership stake. 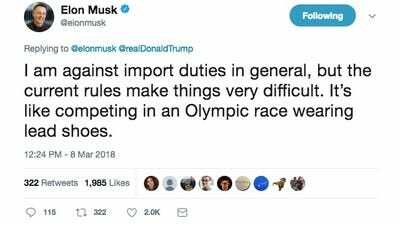 Musk used a tweet President Donald Trump wrote on Wednesday about the United States’ trade deficit with China as an opportunity to air his frustrations with China’s policies toward foreign automakers and ask if the Trump Administration will address them. 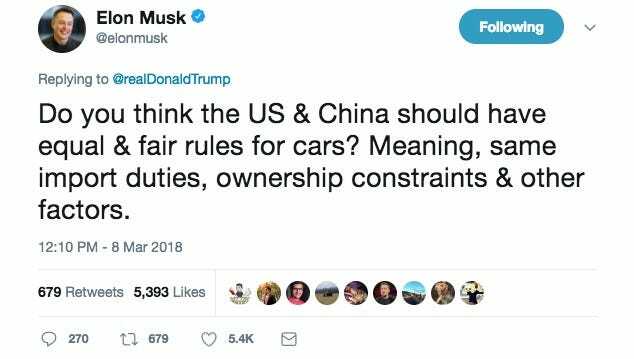 “Do you think the US & China should have equal & fair rules for cars? 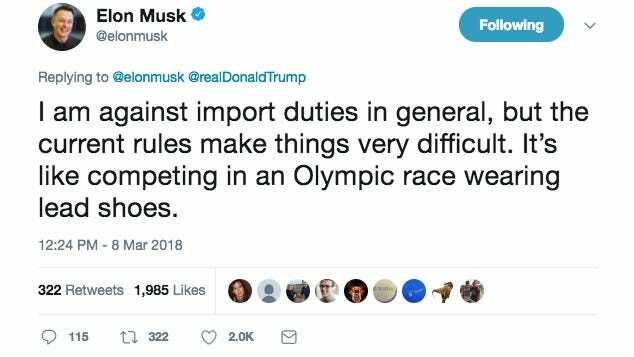 Meaning, same import duties, ownership constraints & other factors,” Musk replied, before describing China’s import tariff, factory ownership policies, and their effect on Tesla. 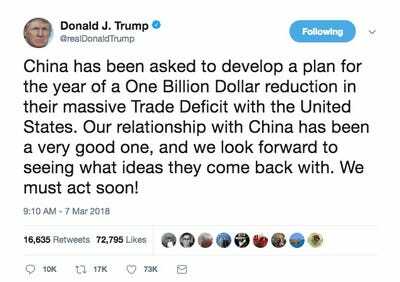 Trump responded to the tweet during a press conference about tariffs, citing Musk’s observation as part of the problem with trade between US and China.